fiResponse™ | Wildland fire incident management. 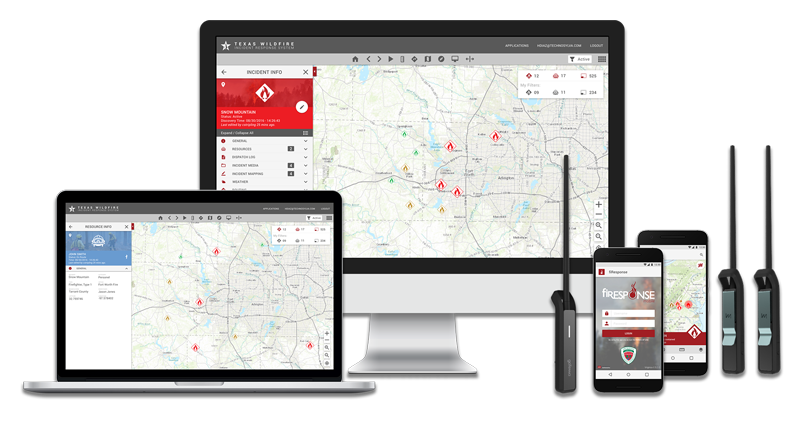 fiResponse™ is an enterprise wide decision support system that provides capabilities for monitoring wildland fire incidents and all associated operational activities related to incident response, dispatch and resource tracking. Supporting the entire lifecycle of an incident. Managing incidents from declaration to control with robust tools for defining, reporting, mapping and tracking incidents. A comprehensive application for inventory & personnel management, resource activation, and resource scheduling and rostering. Real-time tracking of resources using AVL, AFF and GPS capabilities to support resource allocation and firefighter safety. Providing decision makers and operational staff real-time situational awareness – on the desktop, on the web and in the field. Technosylva provides GIS-based solutions for wildland fire protection planning, analysis & modeling, and operational response. Our flagship products, fiResponse™ and Wildfire Analyst™, have been developed through years of applied use by emergency response professionals worldwide. Proven and robust, our software will provide you the key information you need to make critical decisions – quickly and efficiently. Seamless integration and sharing of information in real time are the foundation of our products. We compliment our products with a full range of implementation services including workflow and gap analysis, data model customization, database development, systems integration and configuration, on-site installation, and web & on-site training. fiResponse™ is typically implemented with Technosylva cloud hosting services, although on-premise hosting options are also supported. We strive to minimize the impact to existing IT operations so that you have a seamless and transparent implementation experience. We pride ourselves on providing world-class wildland fire subject matter expertise coupled with leading edge technology. At Technosylva, we love to solve problems and craft solutions. fiResponse™ is a product created by Technosylva. To find out more about the company and their other cutting edge products visit the Technosylva website. Take the next step and get in touch now!